Breast cancer treatment takes a massive emotional and physical toll on patients. Once diagnosed with breast cancer, women brave chemo and hair loss, restructure their lives around treatment, face mountains of research and high healthcare costs, and struggle to cope with the emotions of the experience. Patients in remission must navigate years of examinations and tests to ensure breast cancer does not return, and if it does, it can be treated early. In the face of a high risk of recurrence, women face an endless series of treatment choices, yet extra tests can be inconvenient, expensive, and create anguish when false detections take time and work to resolve. The entire experience is emotionally and physically exhausting, and there's little information available to help patients feel empowered as they navigate their post-treatment decisions. Group Health Research Institute (GHRI) set out to understand better breast cancer solutions with their SIMBA study (Surveillance Imaging Modalities for Breast Cancer Assessment). Conducted between 2013 and 2016, the goal of SIMBA was to be the largest-ever analysis of the effectiveness of mammography and breast MRI, then use the data to empower patients to select the right imaging solution. They gathered perspectives of patients and doctors, then began the analysis with 36,000 breast cancer exams. 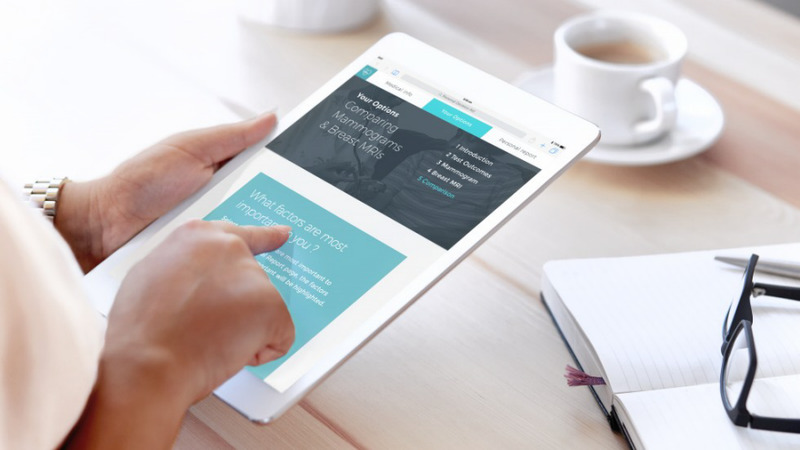 In partnership with GHRI, Artefact designed the SIMBA decision aid: a tool that synthesizes the massive amounts of healthcare options and information to help breast cancer patients understand and discuss their monitoring options. 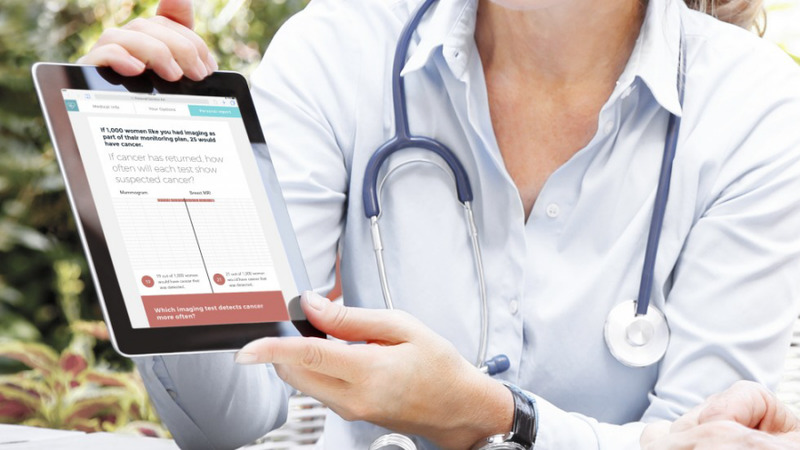 Based on the SIMBA study, the SIMBA decision aid is designed for stage 0-III breast cancer patients to help them learn the facts about mammograms and breast MRIs, receive personalized risks and benefit information, and understand which options are more aligned with their individual priorities and preferences. Today, there is no other place for women to get comprehensive information on breast cancer that also takes into consideration a patient's personal impact. Making healthcare decisions about a cancer diagnosis is one of the most deeply emotional and difficult processes a patient can experience. 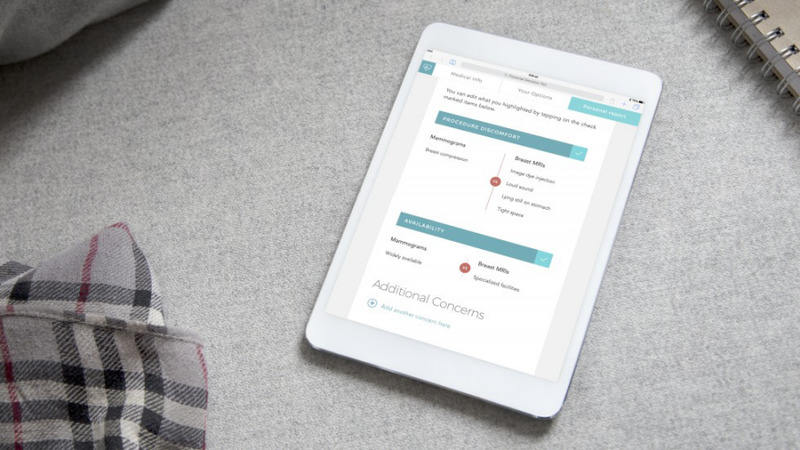 As a decision aid, SIMBA was designed not to just provide information, but to incorporate patient empathy and understanding so that users feel guided and supported as they make decisions regarding their care. The SIMBA application walks women through what it's like to experience each type of imaging, along with stories from women who have been through this decision, and provides a comparison of the various risks and benefits. Women are encouraged to reflect on what matters most to them (e.g., physical discomfort, health risks, cost), and note questions and concerns they'd like to share with their care team. Rather than a tool for making a final decision, the SIMBA decision aid was designed to be part of a larger, shared decision-making process. 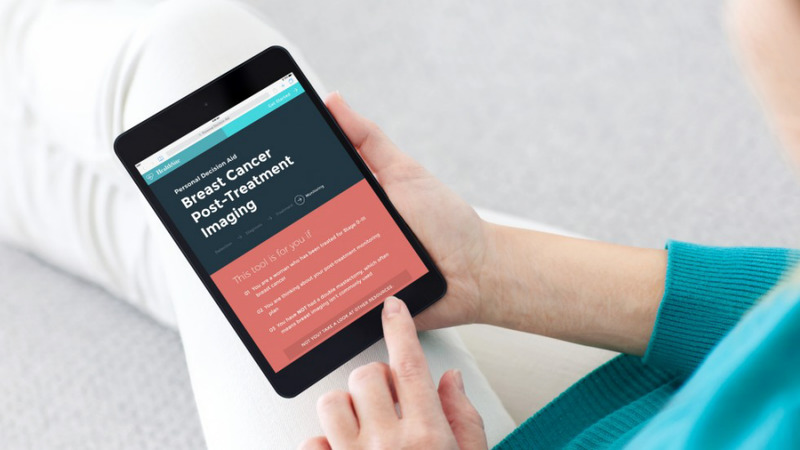 Breast cancer patients can use the site to develop an informed preference, and then talk to their doctors and family members about which way they're leaning. Features like mobile optimization, printing, and emailing ensure the personal report can easily be brought to the doctor's office. The report highlights questions the patient has for her doctor, as well as her self-reported priorities, to help guide the conversation. 1. We started by sitting down with numerous breast cancer patients, as well as medical and surgical oncologists, to understand their experiences making post-treatment monitoring decisions. We needed to know how their priorities, questions, and concerns should translate into content and interaction choices. 2. We conducted a deep dive into existing research about decision aid best practices and success criteria. We gathered insights from behavioral economics, cognitive psychology and human-computer interaction about factors known to bias health decision making and risk perception. 3. We reviewed a series of early design concepts with patients. They provided valuable feedback and suggestions that helped us refine the design and zero in on our final solution. For example, patients preferred comprehensive information rather than spending less time with the tool, so we focused on comprehensiveness and accessibility. 4. We compared the SIMBA decision aid design with a standard decision aid available online today. Women who used SIMBA reported significantly less decisional conflict when it came to choosing a post-treatment imaging option. They felt more informed about their decision and more clear about what was the best choice for them.